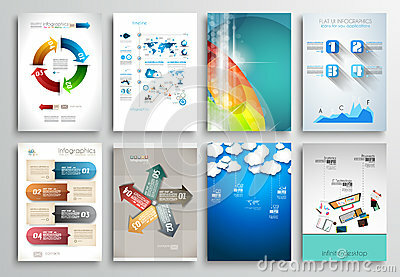 Business infographic template for presentation, education, web design, banner, brochure, flyer. Abstract geometry backgrounds set. A4 format, vector templates. Set of Covers with geometric line shapes. Applicable for Banners, Placards, Posters, Flyers and booklet Designs templates. Brochures, flyers and business card templates set. Mosaic fancy pattern in different designs. A set of blue banner templates designed for the web and various headlines are available in three different designs.